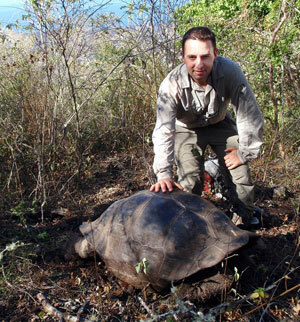 UBC Okanagan conservation geneticist Michael Russello with a Galápagos giant tortoise. New genetic research has identified nine captive giant tortoises as descendants of an "extinct" species formerly endemic to Floreana Island in the Pacific's Galápagos Islands. "Based upon our findings, we now have an opportunity to breed the species and maintain the integrity of this distinct lineage," says Michael Russello, a conservation geneticist at UBC Okanagan. The species known as Chelonoidis elephantopus went extinct on Floreana Island in the 20th century due to human activities. The ultimate goal is to eventually repatriate the lost tortoise species on Floreana so the island can one day support a self-sustaining breeding population of the endemic giant tortoise. "This is a story where humans can potentially right some previous wrongs," Russello says. The discovery of captive individuals of Floreana ancestry was made possible, in part, by the availability of new genetic data from specimens of extinct species of Galápagos tortoises housed in various natural history museum collections. Armed with reference population genetic data from the extinct Floreana species, Russello and colleagues were able to reanalyze previous DNA samples taken from living giant Galápagos tortoises in captivity. "We found nine tortoises that shared a high percentage of their sampled genome with the Floreana ‘extinct' species - up to 94 per cent - and one tortoise may even be a pure-bred," says Russello. "The detection of these giant tortoises in captivity is particularly significant, as it enables a captive breeding program to get underway almost immediately. "It was also quite exciting that theses tortoises (six females and three males) are already living in captivity on Santa Cruz Island at the Galápagos National Park breeding centre, greatly facilitating conservation action." Spearheaded by Adalgisa Caccone and Jeffery Powell at Yale University, who established the Galápagos tortoise conservation genetics program, the research is truly an international, collaborative effort involving a number of different universities, museums and organizations throughout the world, adds Russello, who has been involved with Galápagos tortoise research efforts since 2003.